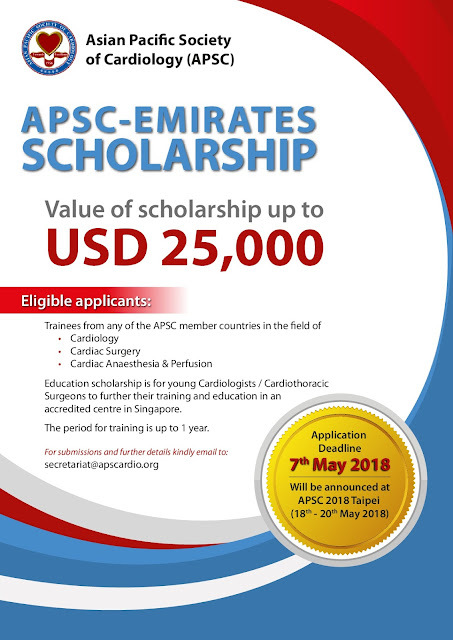 We are pleased to announce that the prestigious APSC-Emirates scholarship for promising fellows in training in ASPC countries is now open for application. Please find attached the announcement flyer and guidelines below. We'd be happy if you could kindly share it to your society's colleagues and friends. APSC nationalities accepted/applying for training in an APSC endorsed training institution. Both applicant and training institution should be endorsed by the respective National Societies prior to granting the fellowship. The endorsement can be granted at point of application, if not already endorsed prior to application. 3. Training should commence within a year of the award, failing which APSC reserves the right to withdraw the funding. In the event of a premature termination of training, the APSC has the right to request a refund of the training award pro-rated accordingly. 4. Preference to be given to trainees for hands-on attachment, and with greatest impact on improving the cardiovascular health of the respective applicant’s communities. 5. Successful applicants are required to submit a training report at the end of their training to the council. They may be required to provide a brief summary of their experience at the next APSC Congress either within the main programme or at an APSC Council event.